Teacher,Maize Geneticist, and Breeder (Robert J. Lambert). 2. Estimating and Interpreting Heritabilityfor Plant Breeding: An Update (James B. Holland, Wyman E. Nyquist, andCuauhtemoc T. Cervantes-Martinez). I. The Meaning of Heritability. IV. Variance Among Selection Units. V. Estimating Heritability as a Functionof Variance Components. VI. Estimating Heritability from Parent-OffspringRegression. VIII. Examples of Heritability Estimates. 3. Advanced Statistical Methods for EstimatingGenetic Variances in Plants (Shizhong Xu). 4. Oil Palm Genetic Improvement (A. C. Soh, G. Wong, T. Y. Hor, C. C. Tan, and P. S. Chew). 5. Breeding Wheat for Resistance to Insects (William A. Berzonsky, Hongjian Ding, Scott D. Haley,Marion O. Harris, Robert J. Lamb, R. I. H. McKenzie,Herbert W. Ohm, Fred L. Patterson, Frank Peairs,David R. Porter, Roger H. Ratcliffe, and Thomas G. Shanower). Literature Cited6. 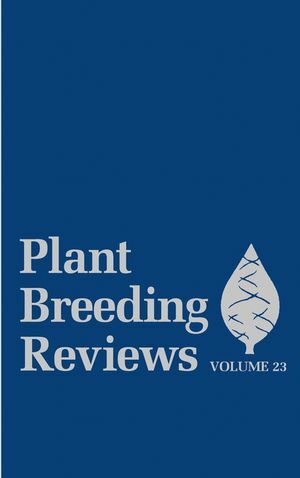 Peanut Breeding and Genetic Resources (C. Corley Holbrook and H. Thomas Stalker). 7. History and Breeding of Table Beetin the United States (I. L. Goldman and J. P. Navazio). III. Horticulture of Table Beet. 8. Yeast as a Molecular Genetic Systemfor Improvement of Plant Salt Tolerance (Tracie K. Matsumoto, Ray A. Bressan, P. M. Hasegawa,and Jose M. Pardo). III. Orthologous Plant and Yeast Genes. IV. Similarity of Cellular Salt Tolerance in Plantsand Yeast.